A special one-day edited version of a very popular class will cover the basic principles of oil painting with regard to painting florals. Although only a day, it includes interesting and memorable overview discussions on composition, massing, building form, light and shadow: and depending on your own style, knowing when a work is finished (learning how to not overwork your painting). Douglas delivers sound principles of painting that are an incredible foundation for your painting, whether a beginner or seasoned professional. After the brief morning intro, a very hands-on approach to the class, gets students mixing colors and painting by 11am. Bringing a brown bag lunch allows a lunch break whenever you need it. The atmosphere is fun, but a quiet and concentrated etiquette will be maintained. Students will work in their own style/technique so that the finished work is their own. Douglas will overview his palette and concepts that his work entails. Students will mix paints and learn to mix very basic strings of high key colors for light and shadow in the flowers and reflections in a white pitcher. 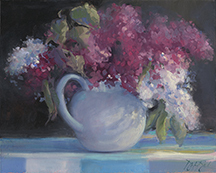 Students will paint from Lilacs or Tulips with strong side lighting in a very simple white pitcher. The thought Douglas puts into these classic arrangements and timeless subjects is as important as the painting itself. He will show you how he does it and why he makes the choices he does. Plan to bring notebook/sketchbook and enjoy a great day together. Plan to do a quick study and a larger painting in this intensive but very fun one-day workshop. Douglas will offer “SPECIAL KIT” which includes all the basic oils, brushes, palette knife, palette and 2 canvas panels, an 8x10 and a 12x16 and medium for those who do not want to buy these supplies individually. You would need to bring some paper towels and rubber gloves. SPECIAL Kit $100. payable directly to Douglas David. Floral/Still Life oils - Utrecht (or your favorite brand) Cad. Red Light, Aliz Crim., Phthalo Blue, Ultram. Blue, Ultram. Violet, Lemon Yellow, Yellow Green, Prussian Green, Yellow Ochre, Titanium or “Permalba” White (larger tube). brushes- filberts- #2,4,6 maybe 8 or 10 or rounds prefer rounds over filberts. 11-3: Paint in studio. Douglas will do a brief demo (study) to get everyone started and will paint a larger demo throughout afternoon. Douglas moves through the group in a rotation so everyone gets equal time.